Los Angeles City Council President Herb Wesson, assisted by John Lee, chief of staff for City Councilmember Mitch Englander, administers the oath of office to our new and reelected board members. From left: Sandi Bell, Michael Teitelbaum, Tom Booth, Olivia Naturman, Barry Seybert, Tony Brosamle, Joan Trent, Bill Rose, Joanne Yvanek-Garb, Esperanza Butler, Carolyn Greenwood, Ed Young. Margery Brown is off camera. The results of the West Hills Neighborhood Council elections on April 17 are official! Stakeholders voted online and at Shadow Ranch Park to reelect 11 incumbents to the 25-member West Hills Neighborhood Council's Board of Directors and elect two new members, Olivia Naturman and Joan Trent. Olivia teaches U.S. history and is dedicated to promoting civic engagement. Joan is a retired high school counselor and English teacher who is active in local PTA and YMCA youth programs. 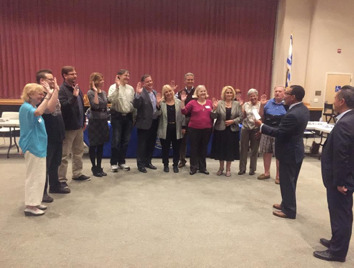 The returning incumbents are Sandi Bell, Tom Booth, Tony Brosamle, Margery Brown, Esperanza Butler, Carolyn Greenwood, Bill Rose, Barry Seybert, Michael Teitelbaum, Ed Young and Joanne Yvanek-Garb. Congratulations to all of our new and reelected board members!